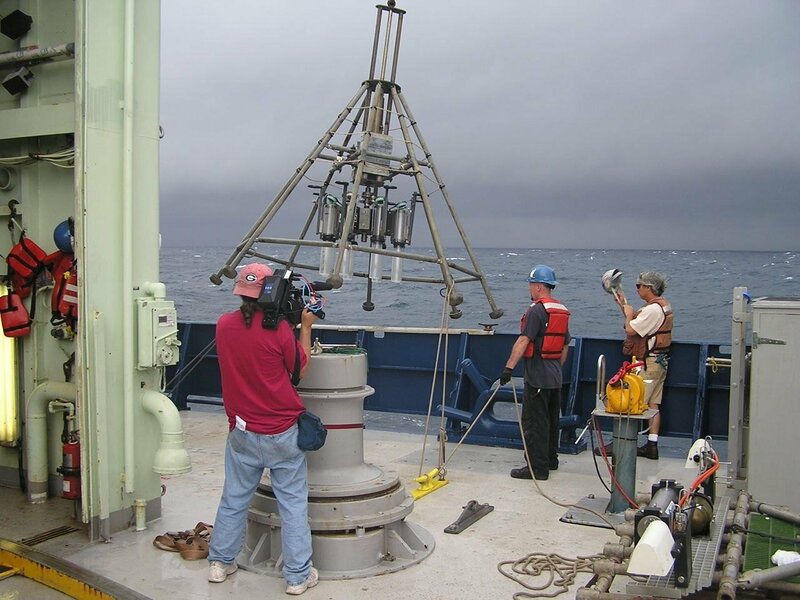 (Click to enlarge) Multicorer deployment in November 2010, near the Macondo wellhead, also on RV Atlantis. The natural microbial community in the water column and on the sea floor of the northern Gulf of Mexico (GOM) surprised the watching world in the aftermath of the Deepwater Horizon Oil Spill (DHOS) by quickly working to help mitigate the effects of the oil. These “magic bacteria,” as some in the media dubbed them, played a pivotal role in processing the hydrocarbons released into the environment by the surge of oil. Jack Gilbert, Assistant Professor at the University of Chicago and researcher at the Argonne National Laboratory, is looking closely at these tiny organisms in the GoMRI RFP-II project, Creating a Predictive Model of Microbially Mediated Carbon Remediation in the Gulf of Mexico, and researching how these bacterial communities might operate in future spills of this magnitude. 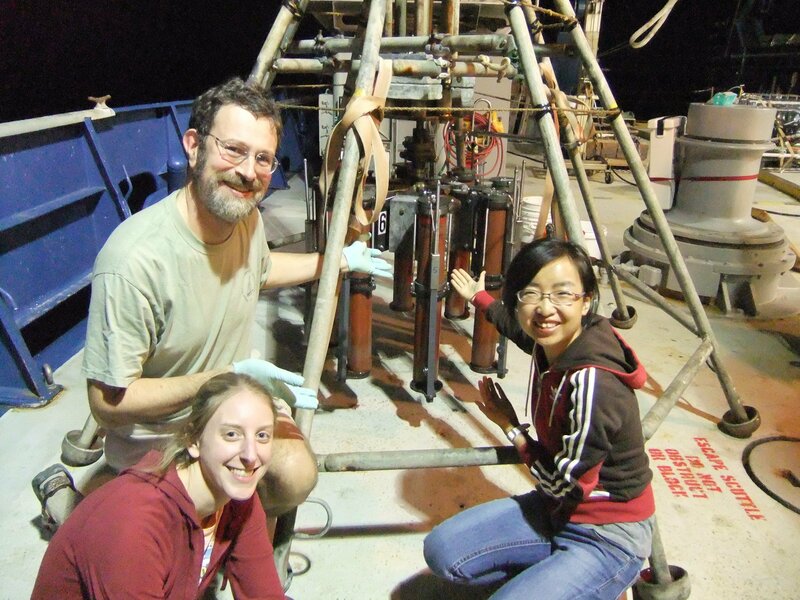 Working with National Science Foundation funding in the immediate aftermath of the DHOS, Andreas Teske of the University of North Carolina at Chapel Hill was in the area within a week of the explosion and continued the taking samples for months. Gilbert and Teske, coordinating with the Department of Energy’s Joint Genome Institute, then extracted the DNA and other genetic material from the bacteria samples in an effort to catalog the various species and understand the “job” of each in the complex society beneath the waves. With the majority of the genetic sequencing completed, the pair, in collaboration with Nicole Scott at University of Chicago, will now begin inputting data into a model to predict the behavior of these bacteria under specific conditions. Gilbert goes back to the metaphor of the city to explain the goal. Just as a drastic changes in weather might change peoples’ jobs in a city—a huge reduction in snowfall in Chicago, for example, might put anyone who works clearing roads out of work—changes in conditions in the GOM might alter the way the bacteria are able to process oil. Gilbert, Scott and Teske’s model will ascertain how temperature changes and other factors could impact these natural processes as they currently operate so that if another oil spill occurs, scientists will be able to correctly estimate the amount of mitigation the bacteria will perform under their current climate conditions and plan accordingly. The modeling infrastructure has been designed, now the model needs to be trained to include new data. Once this process is complete, Gilbert, Scott and Teske can populate the models with new environmental conditions that will play into the predictive process and make it as accurate as possible. Gilbert makes a point that the community that is studying the oil spill—scientists, investigators, policy makers, industrial professionals, and environmentalists—are every bit as complex in their relationships with one another as the environmental system they are all studying. It’s in everyone’s best interest to have a plan in place for future because everyone is negatively impacted when things go badly, so these various professionals work together and provide data that he can use in his model. This research is made possible by a grant from The Gulf of Mexico Research Initiative (GoMRI). The GoMRI is a 10-year, $500 million independent research program established by an agreement between BP and the Gulf of Mexico Alliance (GOMA) to study the effects of the Deepwater Horizon incident and the potential associated impact of this and similar incidents on the environment and public health.